The Eleventh Judicial District Commission on Judicial Performance recommends by a vote of 9-0 that Judge Brian L. Green BE RETAINED. Judge Green was appointed as the County Court Judge for Park County on January 9, 2007. Before his appointment, Judge Green served for two years as a Deputy District Attorney in the Eleventh Judicial District and prior to that, he was employed for five years with Lexis Nexis. He completed his undergraduate studies at the University of Colorado and the University of Iowa and received a Bachelor’s degree in 1993. 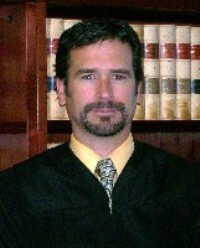 Judge Green obtained his law degree from the University of Iowa College of Law in 1997. Judge Green is a member of the National Association of Drug Court Professionals and has undergone formal DUI Specialty Court training. He regularly holds mock trials for elementary school children and participates as a judge for the “We The People” high school mock trial program. The Commission conducted a personal interview with Judge Green, reviewed opinions he authored, conducted courtroom observations and reviewed the survey results obtained from attorneys and non-attorneys. Among the survey questions was, “how strongly do you recommend that the Judge be retained in office, or not be retained in office?” Of attorneys responding to the survey, 84% recommended to retain, 11% recommended not to retain, and 5% made no recommendation regarding retention. Of non-attorneys responding to the survey, 78% recommended to retain, 12% recommended not to retain, and 10% made no recommendation regarding retention. Judge Green received an overall combined average rating which exceeded the average combined rating of all county court judges standing for retention in 2014. Based on the survey results of attorneys and non-attorneys, Judge Green received an overall combined average rating which exceeded the average combined rating of all county court judges standing for retention. In addition, Judge Green received high marks for treating litigants with respect and compassion and for ensuring that all participants understand the court proceedings. Respondents said that Judge Green displays thoughtfulness, patience, and integrity while on the bench. He is described as fair, even-tempered, considerate and professional.